I decided it was time I tried my hand at using a textured background. I spent a long time looking for one that "jumped" out at me. Then I saw it. This perfect vintage, lettered-styled texture on FlickR. 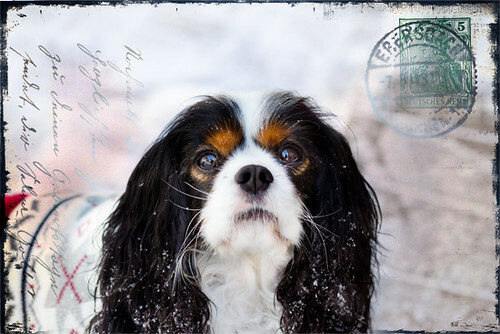 I immediately knew it was going to be used on a photograph of my Cavalier King Charles Spaniels. The old world feel, made it a match well suited to a breed whose heritage dates back to the 13th century. After creating my little masterpieces, I found the "Poetic Winter Photo Challenge". I'm pretty excited as it starts today and this week's theme happens to be "Solitude". I think my photos lend well to that - especially Becky who is giving me the evil eye because the camera has my attention. It is interesting, how the same background takes on a cooler look with Kodee. You can feel her solitude on a chilly, winter day. Then I discovered, it's my Lucky Friday, as participants of the "Poetic Winter Challenge" will be given a free textured background. Perfect timing - and seriously, I had no idea when edited my photographs! Thank you to the generosity of the Angela Wolf - better known as "Joes Sistah" for permitting free use of her textured background today. Angela allows free non-commercial use of her designs and would like a credit link back to her FlickR account. Take a minute and go view Angela's use of texture on her photographs. Trust, me they are breathtaking - a must see! I love how clear and sharp that first picture is. Beautiful dogs! I love how you used the textures on these photos. They are great! Great use of texture! I love Joe's Sistah's textures. She has some really good ones. Your CKC is a beauty! The perfect choices for those photos. I would love to have received one of these by post. Love your use of the texture. 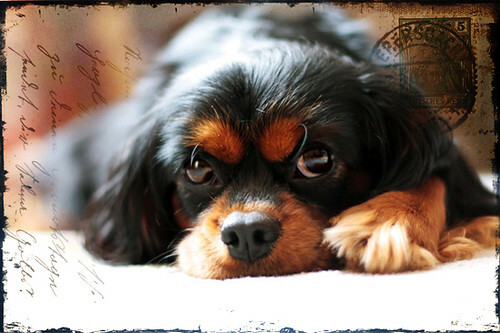 beautiful pictures and your dogs are so cute! thanks for stopping by the other blog. All of them ! Thanks for visiting my blog and leaving me a comment, I'm so glad you did because I could find you and your awesome photos ! The Cavaliers look wonderful on postcards! Aww, what cuties! These shots are lovely. Thank you for sharing! That background really does go well with the Cavaliers! I like the hint of words, and the postmarks!! My favourite is the second one, just something about the posture of the dog! Wow amazing, and indeed captivating.